FINISHING PRODUCTS | Corichem S.r.l. The finishing phase is a delicate and complex cycle. By means of numerous treatments and procedures, the hides take on the necessary characteristics depending on their final usage: resistance to abrasion, rubbing, dirt, drops of water, a certain shine, a particularly silky or oily touch, etc. To obtain this, it is necessary to have specific technical applicative skills, creative imagination that can satisfy the requirements of big brand names and the use of a high number of specific chemical products. 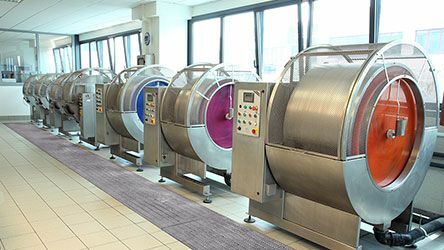 Corichem and its technical staff apply and check the compliance of these characteristics daily in the Finishing Laboratory, carrying out tests to give leather its original properties and guarantee the client the required performance.